Being a full time wife, mom and employee can be tricky at times but if you make the time for the things you love you can make it all work. This took me a while to figure out but once I did, my life was so much happier. I have found for me to be happy I must be creating something. I like to bake and bring the goodies to work (Costco) and hear all the compliments. A lot of times people will ask me how I have time to bake all the time. My answer is easy, I enjoy baking so I make the time to do it. I love baking with my two children. It is great to watch my 3 year old scoop the flour and level it off with a knife. My 2 year old gladly volunteers to lick the beaters and scrape the bowl when we are done. I like teaching my kids and watching them figure it out. It is simple to show them that a few ingredients can turn into something delicious. It's quality time that I love. i wish you'd been in the baking stage when i was living in utah and i could have been your taste tester. Ok, I HAVE to know where that apron came from! It is absolutlely, completely adorbale. Please share! Email me at anniemariewebbphotography@gmail.com if you have a minute. You're amazing Nat!! We love all your baking creations!! You balance everything so well!! You're the greatest! 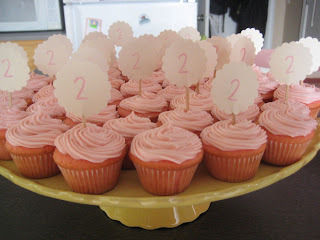 Your cupcake photo inspired me to create cupcakes for my daughter's first birthday party coming up on Sunday. I wasn't sure what sort of cake to make, and the cupcakes in your photo are so classy and simple, I decided to follow suit. Thanks again! I'm gonna have to try the pancakes! You are amazing and a good Mom. I know sometimes it is hard to get it all in but you have figured out a way. 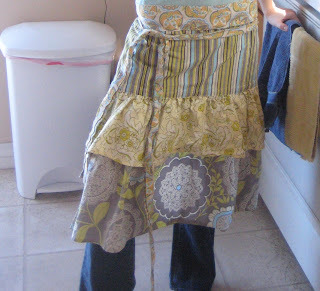 Love that apron! And I love that you work at Costco b/c I have an obsession with it. I am also always bringing treats into work and people ask me the same thing: how do you find time? Like you said, you make it! I actually made those cookies for the first time last week and they are to DIE for...those other recipes looks tasty! I'd love to know where you got that apron from too. Or if you made it where we can get the pattern! I'm SO making cupcakes this weekend! I too LOVE that apron!!! I hope you bought it somewhere cause I can't sew!!! Please let me know where you got it. I'm with you on the whole...if you love it, you can make time for it...thing. These recipes look fabulous...especially the pancakes. Mmmm...love good pancakes. Fabulous apron and fabulous cupcakes! Your co-workers are incredibly lucky indeed.